The Meissner effect is the expulsion of a magnetic field from a superconductor during its transition to the superconducting state. 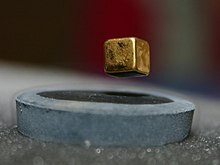 The Meissner effect is shown by a magnet levitating above a plate cooled by liquid nitrogen. The magnetic field has moved up to be above the metal below. The effect was discovered by Walter Meissner and Robert Ochsenfeld in 1933. This page was last changed on 31 May 2018, at 17:49.